Elon Musk has attempted to explain his controversial tweet about taking Tesla private, saying he was "not on weed" at the time. 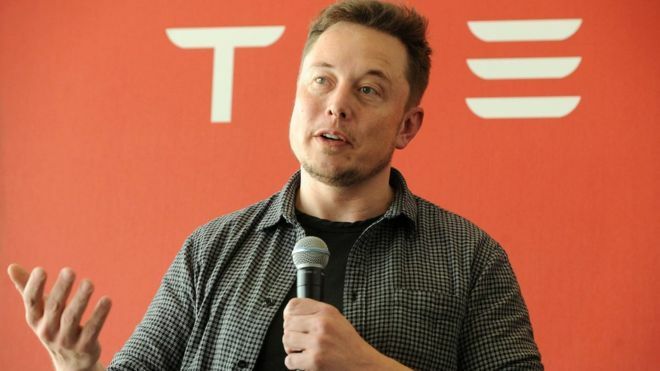 The electric carmaker's founder has been facing intense scrutiny about the 7 August tweet which said he wanted to take Tesla private at $420 a share. "But I was not on weed, to be clear," he said. The price of $419 would have represented a 20% premium over Tesla's share price at the time. "It seemed like better karma at $420 than at $419. But I was not on weed, to be clear. Weed is not helpful for productivity. There's a reason for the word 'stoned'. You just sit there like a stone on weed," Mr Musk, 47, told the paper. His tweet sparked a sharp rally in Tesla's share price, but has also prompted scrutiny. The stock fell more than 6% to $313.79 on Friday after the interview was published. Despite the fall the company is still worth slightly more than General Motors at about $54bn. Fox News has reported that the US Securities and Exchange Commission (SEC) had sent subpoenas to the electric carmaker and was "ramping up" its investigation into the tweet.